A recent communiqué by Fitch Ratings asserts that Sri Lanka is taking steps to reduce fiscal and economic risks while also restoring policy certainty following the disruption caused by political upheaval late last year. The rating agency highlights Sri Lanka’s agreement with IMF staff’s fifth review and extension of its programme together with the recent budget targeting medium-term fiscal consolidation. 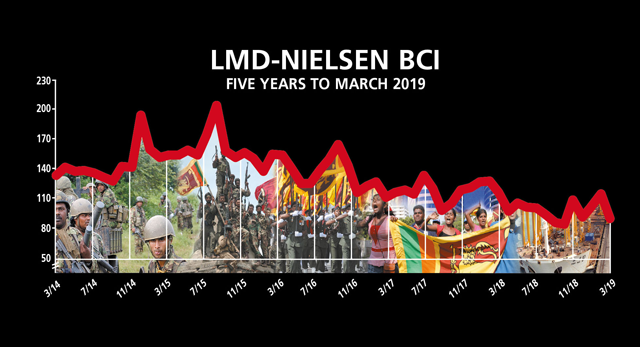 Meanwhile, the outcome of the latest LMD-Nielsen Business Confidence Index (BCI) survey, which was conducted before Budget 2019 was presented in parliament, reflects muted sentiment among corporates. THE INDEX Despite recording two months of impressive gains, the BCI declined by as much as 25 basis points – the highest fall since December 2016 – to register 90 in March compared to 115 in the previous month. The index has also fallen below its 12 month average of 98 and is a massive 27 points short of where it stood a year ago. “Unlike in previous years when sentiment usually improved before the budget presentation, the BCI for March dropped,” he notes. SENSITIVITIES Respondents cite high taxes as a major issue impacting their business performance as well as consumer demand. Meanwhile, the other key corporate concerns include inflation and political interference. PROJECTIONS Whereas the previous month’s BCI may have pointed to a renewed sense of optimism about both business prospects and the national economy, the latest survey affirms that corporate sentiment is as volatile as ever here in Sri Lanka. Granted, the prospect of the budget was a likely cause of apprehension among respondents who may now have time to digest the government’s fiscal policy proposals. At the same time, pertinent questions have been raised about the feasibility of achieving the targets set out in Budget 2019. With the budget done and dusted so to speak, one may expect sentiment to nudge upwards in the months ahead until of course, politics takes sway with a presidential poll due before the year ends.